Let’s leave this one for the Constructed brewers, as you aren’t going to be turbo’ing out things like Enter the Infinite in Limited. 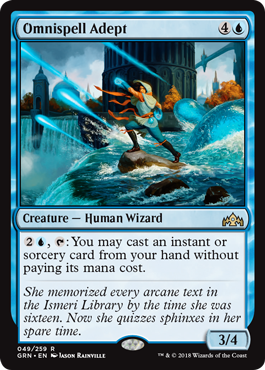 Still, this is a 3/4 for 5, which doesn’t have the worst stats, and does let you play spells at a discount or at instant speed. I’d run this if I was really short on creatures, which does imply a lot of spells, though I wouldn’t be looking to try and cheat in off-color spells or anything like that.